Simon the Saxophone-Playing Squid is a collaboration between Skype, Pereira & O'Dell, illustrator Darren Farrell and the Little Waves Band. With work hours and business trips increasing across the country, parents are finding it more difficult to make it home in time for story time with their children. Simon the Saxophone-Playing Squid is a free digital children’s book offered by Skype that parents can read to their children over Skype via screen sharing for the ultimate bedtime story. This is just one example of the many ways parents can use Skype in their everyday lives to spend quality time with their children. To activate the screen sharing feature, during a video call, click the "+" button and select "share screen". Once this is complete you're ready to take the underwater journey together. In the original story, Simon is a curious sea creature who discovers an unfamiliar object at the bottom of the sea. With the help of his friends, he figures out just what this strange thing is and discovers a new passion. Go to http://skype.com/storybook to read the book and download the song for free. Also watch the video showing how the artists collaborated over Skype to produce The Squid Song, an original song with lyrics found in the back of the book. 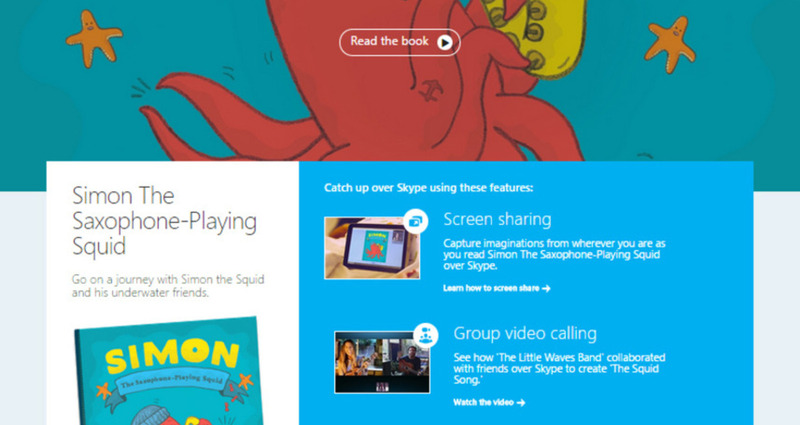 Parents can read Simon the Saxophone-Playing Squid to their children with Skype's screen sharing feature, ensuring they never have to miss story time again, even during business trips or late nights at the office. Simon the Saxophone-Playing Squid is part of the larger Skype campaign launched by Pereira & O'Dell in 2014, "The Things We Can Do", which shows how real people use Skype to enhance their everyday life. Pereira O'Dell Client: Memorial Sloan Kettering Title: More science. Less fear.